Price per person. Cost Includes: Motor coach transportation, trail fees, lodging, “Taste and Glide” event and free continental breakfast. For more details, see flyer. Price per person thru 1/30/19. Cost Includes: Motor coach transportation, trail fees, lodging, “Taste and Glide” event and free continental breakfast. For more details, see flyer. 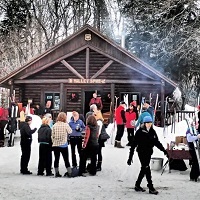 Join us for our popular ski trip to Valley Spur near Munising, MI. Save $20 if you register by 1/30/19. We will leave Friday morning at 8 am and will ski at Brown County Reforestation Camp near Green Bay (30 km of ski trails, chalet, and 3 km of snowshoe trails) or at Valley Spur. We plan to ski Saturday and Sunday at Valley Spur Ski Trail with 45 km of trails that are some of the most scenic to be found anywhere. Valley Spur Ski Trail is in the Hiawatha National Forest outside of Munising MI. Picturesque, 3-km snowshoe trails are also available, and a cozy log cabin. Saturday is the annual “Taste and Glide” event (included in the trip price) that benefits Valley Spur. Lots of delicious food and beverages will be at several stops along a beginner trail as well as in the log cabin. Accommodations are at the Holiday Inn Express near Munising with sauna, whirlpool, swimming pool, free continental breakfast, and microwave and refrigerator in each room. All ski areas have both skating and striding trails for all skiing abilities. Cost Includes: Motor coach transportation, trail fees, and two nights accommodations at the Holiday Inn Express. Special things to remember include a spaghetti dinner (BYO beer or wine) on Friday evening as well as Saturday's annual Taste & Glide event. This is a popular end-of-the-ski-season event for both skate and classical style skiers. For questions, please contact trip leader Paul Keber at 262-547-4827 or pkeber@milwpc.com.